It is a crisp Saturday morning in March. As you walk towards the library, you see people with neon peace signs on their faces and brightly colored T-shirts. At the library, you enter a large room full of talking, laughing people. There are stands and tables everywhere, and even a rock band playing. Find this strange? Well, if you live in Maplewood, New Jersey you wouldn't. NJ Star-Ledger's coverage of the rally. MoveOn is the rally sponsor. Our Newark event at the offices of Senators Booker and Menendez is one of hundreds of similar events at Congressional offices across the country. 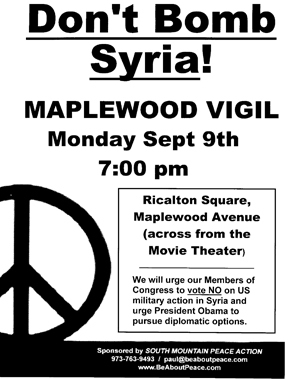 Monday evening of September 9, 2013, on two-days' notice, more than 80 local residents held a candlelight vigil in Ricalton Square calling on Congress to vote No on the authorization for US military action in Syria. The vigil was hosted by South Mountain Peace Action as one of more than 200 vigils coordinated around the country by MoveOn.org. 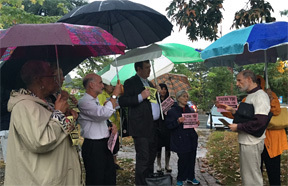 The SMPA petition -- calling on Congress to vote No; for the President to refrain from military action and wait for the UN inspectors to complete their mission; and for the US to comply with the UN Charter -- was circulated at the vigil. Speakers urged the President to refrain from war against Syria and to return to his long-held position that war should only be waged in self-defense or if authorized by the Security Council. Others emphasized the need for the US to address domestic issues rather than intervening in another country's civil war. 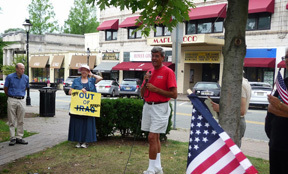 Speakers expressed the need to call and email New Jersey Senator Robert Menendez who has endorsed a military attack on Syria and Senator Jeffrey Chiesa, whose position is not known. 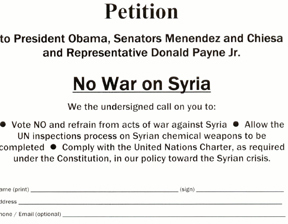 Speakers also expressed regret that Congressman Donald M. Payne Jr. remained "undecided" on a Syrian attack and that he failed to join 62 antiwar Democrats who sent a letter to President Obama calling for a Congressional vote and for a policy consistent with international law and in compliance with the UN Charter. 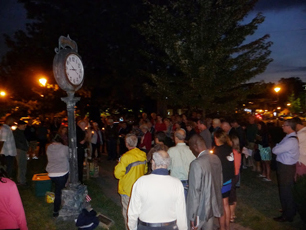 The vigil concluded with a moment of silence for those killed and injured in the wars in Iraq and Afghanistan. :: Article in Maplewood Patch. 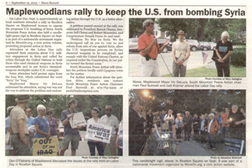 At the Maplewood Labor Day rally, South Mountain Peace Action launched a petition "No War on Syria" to the President, New Jersey's senators and Rep. Donald M. Payne, Jr. opposing war with Syria. Please download and print out the petition, circulate it and call South Mountain Peace Action chairman Paul Surovell at 973-763-9493 when you're done or by Monday September 9th at the latest, so we can consolidate all the petitions and deliver them to the elected officials. Maplewood Mayor Vic De Luca addresses crowd. Tell them: "No US military action in Syria. Observe the United Nations Charter." Or email the White House here and tell the President to comply with the United Nations Charter and allow the inspections to go on. Hans Blix was the chief UN arms inspector for Iraq from 2000-2003. He was also the head of the International Atomic Energy Agency (IAEA) from 1981 to 1997 and Swedish minister of foreign affairs (1978-79). He spoke with Global Viewpoint Network editor Nathan Gardels on Monday, August 26. Nathan Gardels: Based on your experience, and what you've seen in recent days, do you believe the verdict of the Western intelligence agencies that Assad used chemical weapons is credible and reliable? Hans Blix: The are certainly in the direction of the use of chemical weapons. Also, the circumstantial evidence points to the Assad regime carrying out the use of such weapons. we all should wait to see the report of the inspectors before action is taken. Nathan Gardels: An echo of Iraq under President Bush? Hans Blix: In a way, yes. Then, too, the Americans and their allies asked for inspections for mass destruction weapons. Then, too, they said, "forget it, we have enough evidence on our own to act. We are the world police. Our publics are demanding immediate action!" I do not go along with the statement by the U.S. that "it is too late" for Syria now to cooperate. That is a poor excuse for taking military action. Only last March, the West was satisfied with inspections concerning the use of chemical weapons. Why can't they wait again now? In one month when you have accurate tissue samples we will know for sure exactly which kind of chemical weapons have been used and who possesses such weapons. Gardels: But now it is President Barack Obama, not George Bush, taking on the role of world policeman? Hans Blix: Yes. He was the only one, some time ago now, who talked about international legality. I was heartened by that. 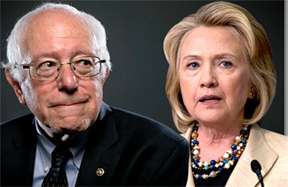 But now I'm afraid the politics of the moment are pushing him in a direction we've seen before in the United States. British Prime Minister David Cameron also doesn't seem to care much about international legality. And this time, neither do the French. As far as they are all concerned, a criminal act has been committed so now they must engage in what they call "retaliation." I don't see what they are retaliating about. The weapons weren't used against them. It should be the rebels who want retaliation. If the aim is to stop the breach of international law and to keep the lid on others with chemical weapons, military action without first waiting for the UN inspector report is not the way to go about it. Nathan Gardels: Do the Western intelligence agencies know where the chemical weapons are? Are they vulnerable? Can an air attack be effective? Hans Blix: Well, the Israelis know where they are. 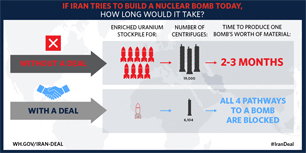 But attacking stockpiles with cruise missiles, as I understand it, has the disadvantage that it might spread chemical weapons in the vicinity of any attack. 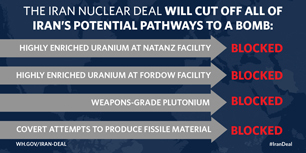 Nathan Gardels: What are the implications of the U.S. and its Western allies once again taking action without the United Nations? There was Kosovo, then Iraq, then Libya. Now, it appears, Syria will join the list. Hans Blix: In Kosovo the intervention was based upon NATO approval. This was not enough. I do not think NATO approval is satisfactory in terms of international law. You need to have Security Council approval. 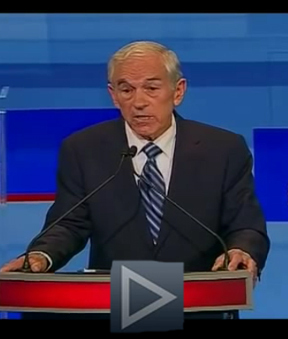 In the Iraq case, the Bush administration did not care at all about the UN. They just went ahead with the British and a few others. They were totally contemptuous of the UN. I remember that John Kerry, now U.S. secretary of state and who was a senator then, was ridiculed at that time for saying the U.S. should wait for UN inspections and approval of action. In the wake of the Iraq war, Obama, in his Nobel lecture, also argued that military action should not be taken against other states without UN Security Council approval. That was then, I guess. Now is now. In Libya, there was a Security Council resolution, but it was very liberally interpreted after the fact, strained from its intent to protect civilians under impending attack to the overthrow of Kaddafi. Nathan Gardels: But the Russians and Chinese will never agree to take military action against Syria, so why even try the UN route? Hans Blix: The Russians and Chinese have said they want "fair and professional inspections" in Syria. 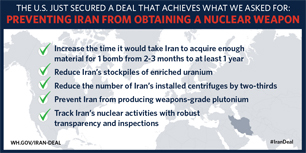 The Iranians have also agreed. 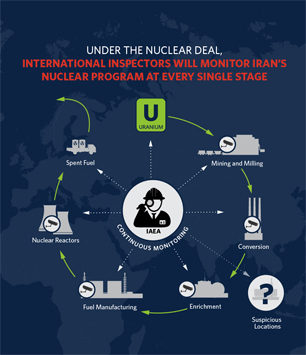 In this matter they have a serious interest; the Iranians have suffered most in the world from the use of chemical weapons in their war with Iraq during Saddam's time. In my view, it is certainly a possibility that you can achieve world condemnation of Syria in the Security Council -- including from Russia, China and Iran -- if inspections prove the suspicions. Nathan Gardels: But they will never go along with military action? "What kind of military action is really possible, and what will it really do?" A cruise missile attack on suspected weapons depots in Syria will mean little, and perhaps nothing. Remember President Clinton's punitive cruise missile attacks in 1998 on reputed terrorist training camps in Afghanistan and a supposed nerve agent factory in Khartoum in Sudan. The pinpricks in Afghanistan did nothing to stop Al Qaeda. Khartoum turned out to be a total error. It was a pharmaceutical plant. If military action is all about "punishing" Assad to satisfy public and media opinion without even hearing the UN inspectors report, it will be a sad day for international legality. Two December 2012 polls in Israel found 67% support a two-state solution based on the 1967 borders, with land swaps; a demilitarized Palestine; and Jerusalem's Old City administered jointly by the United States, Israel, and the Palestinians, with Israel maintaining control of the Western Wall. The polls were conducted by Smith Consulting and the Dahaf Institute for the S. Daniel Abraham Center for Middle East Peace. 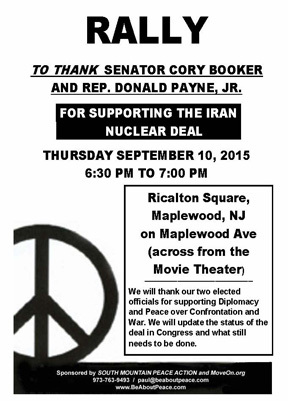 Congressman Donald Payne represented Maplewood and most of South Orange, NJ. Congressman Payne was a sterling fighter for peace and justice, who never forgot his modest roots. He supported many initiatives of South Mountain Peace Action and often took part in our activities. His passing is a great loss to America and the world that has meaning only if we rededicate ourselves to the noble causes of peace and justice that Congressman Payne believed in and worked for. We extend our deepest condolences to the Payne family. Click the links below to view Congressman Payne's remarks at SMPA's Be About Peace Day on March 24, 2007. It is time to bring our troops home from Afghanistan and Iraq, reduce nonessential military programs and redirect the resources saved to rebuild America. 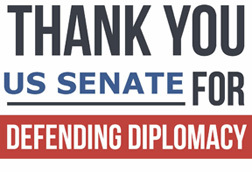 In this manner, we urge you to enact military spending cuts totaling $2.3 trillion over 10 years, as provided in the "People's Budget" of the Congressional Progressive Caucus, and to use the funds saved for job creation, education, the environment and deficit reduction. 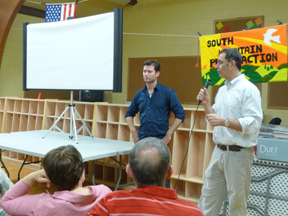 Shlomi Ben Yair and Just Vision chmn Bradley Abelow discuss "Budrus" after screening on June 25, 2011 at the Maplewood Civic Center. For more photos click here. 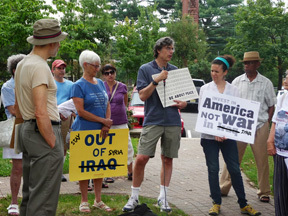 South Mountain Peace Action calls for the United States to adopt a timetable to withdraw its troops from Afghanistan like the withdrawal timetable in Iraq.